Aca-pocalypse Now: Wilson earns her right to monopolize the spotlight in Banks' freewheeling musical comedy. Mad Max: Fury Road is a sequel that boldly redefines its series. Pitch Perfect 2 is the kind of sequel we're all more used to seeing: one that painstakingly hits every beat audiences liked in the first film, and hits it twice as hard. Since it's a comedy about college a cappella, there's no lack of beats, literal or figurative. But they feel less fresh this time around. In the 2012 sleeper hit Pitch Perfect, an ailing all-female singing group called the Barden Bellas found its voice — and won a national title — with the help of a too-cool-for-school aspiring DJ named Beca (Anna Kendrick). The sequel finds the Bellas resting on their laurels — or rather, cavorting and contorting on them, as they perform a bells-and-whistles-laden number for the POTUS at Lincoln Center. A wardrobe malfunction leads to talk-show infamy, which puts the Bellas back where they were in the first movie: in the underdog Delta House of college a cappella. Banned from touring and recruiting, the women seek last-ditch redemption in the form of a daunting world championship. No viewer of such movies will have a single doubt about this one's destination; the fun is in the road trip. What made the first Pitch Perfect appealing, even to those with little love for warbly pop medleys and mashups, was its willingness to embrace the inherent silliness of its subject. The whole thing had the anything-goes quality of a tale told by an excitable 14-year-old girl at sleepaway theater camp, studded with gleeful sexual innuendos and terrible wordplay involving the prefix aca-. Returning screenwriter Kay Cannon seems to assume audiences are invested in Beca's artistic development, yet her conflicts remain something of a whiny buzzkill. 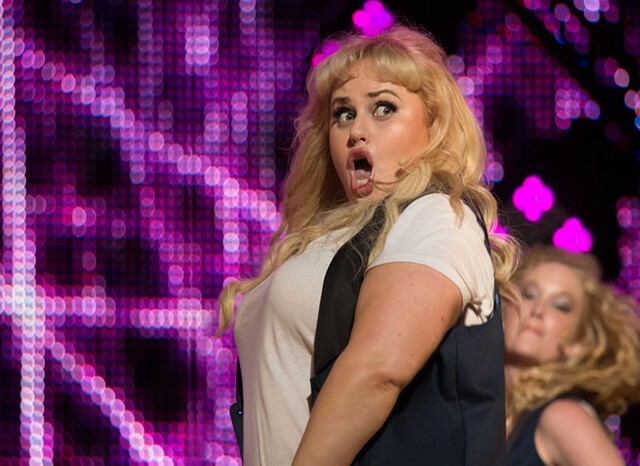 Perhaps the filmmakers should instead have bitten the bullet and given protagonist status to the series' closest equivalent of John Belushi: the unflappable, indomitable Fat Amy (Rebel Wilson). Wilson doesn't do much new here, but her blissfully bizarre — and athletic — rendition of Pat Benatar's "We Belong" is still the film's comic and emotional highlight. Sequels offer opportunities to flesh out one-joke players, of which Pitch Perfect 2 has many, yet here the prolonged attention just makes them seem more like caricatures. Especially egregious is the mishandling of newcomer Chrissie Fit, as a Guatemalan Bella who delivers what's no doubt intended as acerbic commentary on the first-world problems driving the plot. But because that's all she does, she comes across as an offensive cartoon. "We spit on originals!" cries one of the film's many overzealous a cappella purists when Steinfeld's character attempts to perform a composition of her own. Thematically, Pitch Perfect 2 promotes an inclusive vision in which wild-eyed mashup artists and die-hard enthusiasts of '80s covers can make beautiful music together. In practice, though, the film is strictly on the side of the cover artists, reproducing the first movie's formula with slavish accuracy. Audiences who enjoyed the tuneful goofing of Pitch Perfect are likely to enjoy the sequel, too — while it's not particularly good, it's still fun. But there aren't many original elements here to spit on. Pitch Perfect 2 is not showing in any theaters in the area.